We're giving the Olympics some space on the Concepts page on Sundays for a while — even though the NHL wants no part of it. This week, Jake Miller brings us a new take on Team Netherlands. With the 2018 Winter Olympics around the corner, I thought we could start featuring some national team concepts. Jake Miller gets us going with a sharp look for Estonia — which interestingly enough could work just as well for the Tampa Bay Lightning. 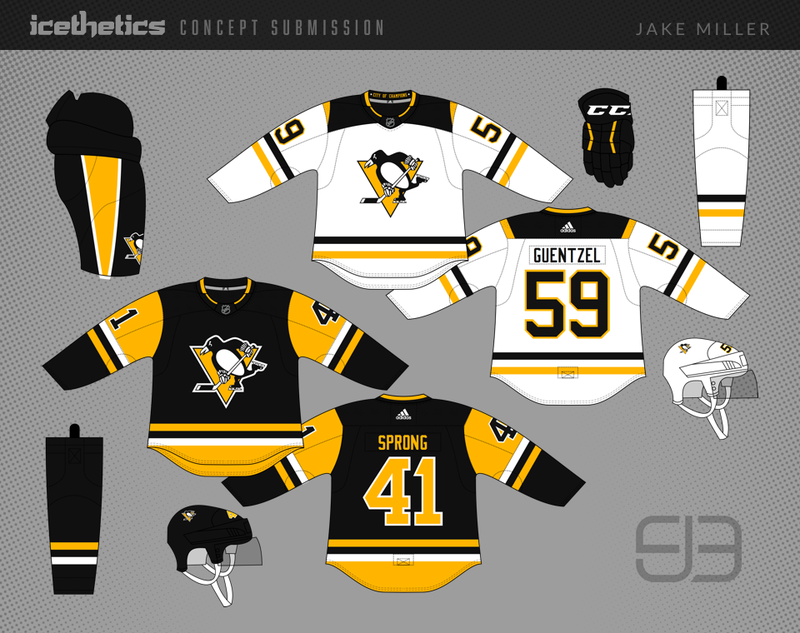 The Penguins have pretty solid uniforms these days, but Jake Miller thought he could make some adjustments. What do you think? Jake Miller brings one of the Sharks' secondary logos to the forefront with this new set. It looks genuinely fierce and proves you don't need the orange to make San Jose's look work. Last week, the Tampa Bay Lightning opened a unique survey asking fans what they'd like to see in the team's next third jersey in 2018-19. If they went with a new design, they might be wise to hire Jake Miller to handle the task. I'm not sure if he's going for grey or silver, but I'm a fan!